Back to Gramsci: we are all intellectuals. We all work with our intelligence. A teacher is no greater than a plumber or a stagehand (I have no doubt that the reverse can often be true). But some people hold the function of intellectuals and others do not. It is a matter of occupation. One specialises in one’s occupation. We all know about politics however and in democracy we must all have the right to speak up for ideas in public. That is why the letters to the editor are one of the most worthy sections of a decent newspaper. It is in the letters where you find the plain people [in Spanish, el pueblo llano, a direct cognate] writing (though the professionals of politics want to occupy that sphere too). They are a reflection of society, that is, unless they have been tampered with. I was thinking about those lines when I read the one by Donna Hartnett in today’s Irish Independent. The letter has won a lot of public acclaim, and rightly so. Eloquent and moving, honest, resolute and defiant. A person at the end of her tether who turns the focus onto the everyday inhumanity of daily life in Ireland, and its consequences for children. The word infant –I learned this from one of Monedero’s books- means ‘unable to speak’. So it falls on others to speak for them. In this case, Donna Hartnett speaks for her children, confined like so many others to a regime that we prefer not to consider as inhuman, even though we know it is. But in so doing she ends up speaking for other people’s children, and for other people too. “I’m one of the silent majority”, said a caller who supported the water charges on Liveline recently, oblivious to the irony. The “silent majority” are often the object of the worst form of populism: the one that claims to speak on behalf of the people so long as they appear to say nothing. Within that “silent majority” are over a million children under the age of 15, whose voice counts for nothing. Over 300,000 of them are living in enforced deprivation, but as Donna Hartnett’s letter suggests, that is not the full extent of the inhumanity by a long shot. 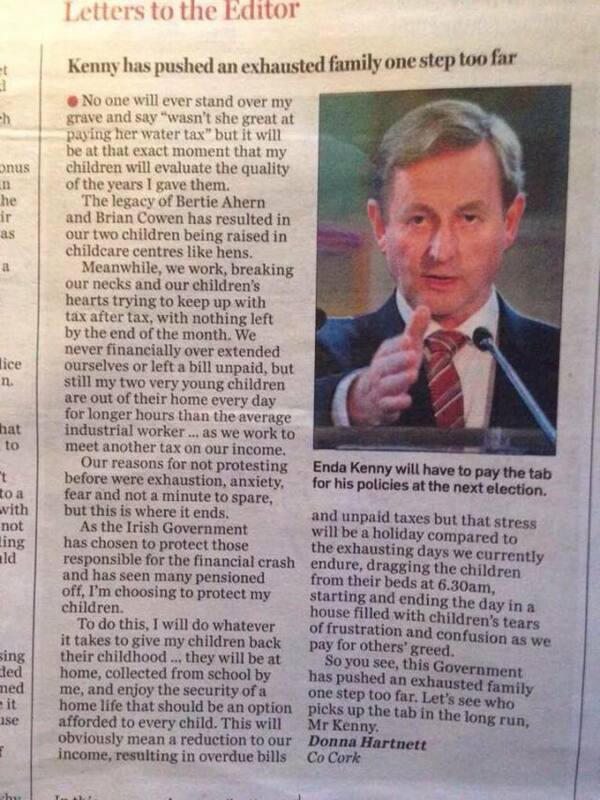 But it isn’t just children who are rendered without a voice by Ireland’s political and economic system. As the letter shows, it is their parents, guardians and carers too. It is a great many people for whom the day-to-day struggle to get on with things, to make ends meet, to keep a home on an even keel, renders them voiceless in the political arena. Then, when it comes to saying something, doing something, where do you start? Turn on the radio, any current affairs or talk show and all you hear about is how your problems are your responsibility and of your own making. Here are some guidelines from a psychologist or a personal finance expert or a careers specialist, now paddle your own canoe. The crisis generated by Irish Water, and the unprecedented public mobilisation in response has exposed the ingrained condescension of Ireland’s party political machine. These people, they tell us, are being led astray by hard left agitators, by professional grievance merchants, by sinister fringes. Behind these utterances lies the conviction that the plain people have no mind of their own. They are, in short, infants. There is a Greek-derived word for this condition that grips people like Pat Rabbitte: demophobia. If the Irish Water mobilisation has achieved anything, it is this: a realisation that we are not alone, that we are not condemned to isolation and private implosion. When I looked at social media responses to Donna Hartnett’s letter I saw the same word cropping up over and again: brave. But why should it be brave to say such things? What is it that prevents us from speaking out more, and louder? A sense of personal shame? A reluctance to disturb relations with others in our personal circles or workplaces that might be superficially friendly, but we sense are conditional on keeping quiet about uncomfortable things? These are questions, I imagine, that will never be probed too deeply in Ireland’s newspapers. Donna Hartnett’s letter will be repositioned in terms of tax cuts intended to maintain the status quo, or the squeezed middle, or family values, or governmental incompetence. I imagine attention will be diverted away from the root of the matter and in a few days balance will be restored to letters pages, with anxiously droll wordplay and pompous officialese flooding those spaces once again. It is on the streets in protests and in meetings on the grass verges of housing estates and on social media pages that the germ of a collective answer will most likely be found. And when it is found, that is when an audacious democratic awakening will take shape.